Last Saturday I attended 'The art of wellbeing tour' at Manchester Art Gallery with my partner James. The last few weeks have been manic as I have started a new job so it was really nice to take some time out together to do something both at the gallery and around mindfulness. The basic premise is to look at five pieces of art in the gallery chosen to reflect the new economics foundation's 'Five Ways to Wellbeing'. The Five Ways to Wellbeing are: Connect; Be Active; Take Notice; Keep Learning; and Give. The listing for the event on the Manchester Art Gallery website starts: 'Wellbeing is a skill. Cultivate it with us', before inviting you to 'discover the secrets behind the paintings.' The works were chosen by tour guide John Ward who gently navigated his way through the gallery like the bell of a jellyfish with a small crowd of us silently trailing behind - it's tentacles swaying softly in the water. There's something about art galleries that invites that gorgeous sense of slow quiet, manifesting without question from the majority of its' visitors only interrupted by the delighted shrieks* of children playing in the interactive Clore Art Studio as we meandered past. Of course it is no coincidence that this tour regularly takes place inside the gallery - they do a number of mindfulness and wellbeing based initiatives as part of the 'Mindful Museum' campaign. The first painting we looked at was Winter Morning painted in 1906 by George Clausen (1852-1944). John linked this painting to 'Take Notice' - the here and now in the world of the painting, but also to 'Be Active' - although it initially appears to be a landscape, the human figures in the painting are hard at work. John went on to propose that art is more than just visual sensations, using the solidity of Clausen's trees as an example that sets him aside from typical impressionist painters. Next up was 'Kitchen Interior with Man Bringing Fish for Sale' from 1657 by Hendrick Sorgh (about 1610-70). According to John there was no finer painter in Dutch market scenes or still life at the time Sorgh was working. This painting is an example of a genre painting set inside a middle class household. One question John posed really struck me - the notion that genre paintings were perhaps 'the reality TV of the 17th Century' - humans have always been fascinated in what goes on behind closed doors. John positioned this painting as a celebration of humanity, of trust, collaboration. Of all the things that make successful families, workplaces, societies... and in this way it is representative of 'Connect'. We moved into the main body of the building to see the next painting, Autumn Leaves from 1856, painted by Sir John Everett Millais (1829-96). This Pre-Raphealite work has a 3D appearance bound up in its' luminous colours, despite its' more sombre setting and the solemn expression of its' subjects, the sisters of the artists' wife, Effie Gray. Interestingly, the painting was exhibited at the Royal Academy in 1856 and received a fair amount of criticism, however it was in fact Effie's ex-husband John Ruskin (leading art critic of the Victorian era don'cha know) who came to Millais's defence, telling his fellow critics that they 'didn't know excellence when they saw it.' There is also the juxtaposition of the decaying leaves and death of summer with the young girls in the 'Spring' of their lives. For John, this represented 'Give' - the gift of friendship, of the nature all around us, of talents to be shared and treasured. Our fourth stop was the subject of some very recent controversy for the gallery (in this instance do read the comments if you want to see why) - Hylas and the Nymphs from 1896 by John William Waterhouse (1849-1917). The work was recently removed from where it hung for a period of 7 days during a 'take-over' of the galleries spaces by Sonia Boyce as part of the build up to her upcoming retrospective at the gallery. Although the discussion of the painting, it's themes, the story depicted, even the discussion around its' recent controversy were all very interesting...for me the thing that captured my attention and gave me pause to reflect was what happened in the painting's absence. 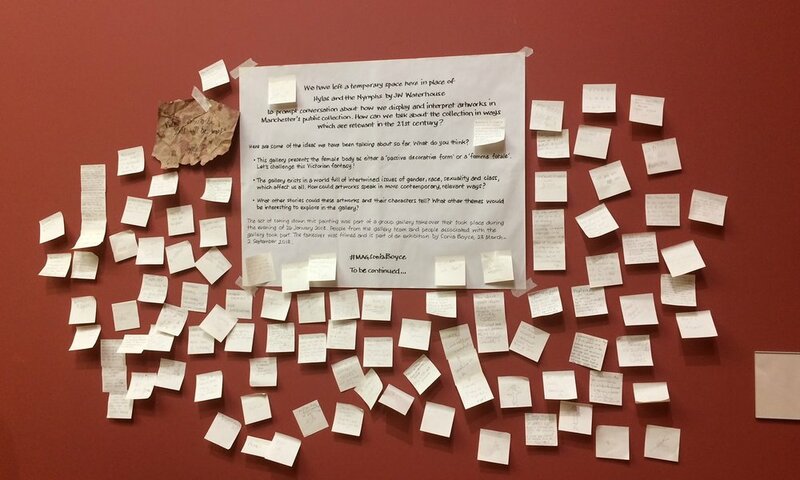 A temporary space was left with visitors invited to write their views on post-it notes. I really like this idea - of leaving a space where something heavy once hung. A space for contemplation, for thoughts, reactions. The post-its were left in place of something huge and thought-provoking, their flimsy part-sticky pastel form a far cry from the original work. There is something powerful in silence and absence which induces thought and meaning where it perhaps was missing before. Reflecting on something in front of you is one experience, reflecting on its' absence is another entirely. inally, Montagna Mia painted in 1923 by Annie Swynnerton (1844-1933) which is part of the current Swynnerton exhibition 'Painting Light and Hope' in the gallery until January 2019. The work showcases Pre-Raphaelite ideas of colour and careful outlines set against impressionist backgrounds and surroundings. I can see why John chose this painting to finish the tour as it pulled all the works together. The painting itself is very beautiful, depicting the sculptural form of the top half of a young female body on top of a much more hazy mountain landscape. John calls this 'impressionistic otherness' - where we can see something but it is difficult to discern any precise features. This painting was linked to 'Give' - both because it was gifted as part of a bequest left by Swynnerton to Manchester Art Gallery when she died, and how her lifetime linked two ages - the 19th and 20th centuries. Swynnerton's work was also linked to 'Take Notice' - using art to take ourselves into that other world to escape the tensions and worries of the day to day existence, to become lost in it. As part of the gallery's 'Mindful Museum' campaign, they have an upcoming exhibition: 'And Breathe...' co-curated with a community mental health group and a group of primary school pupils to explore the relationship between art, positive mental health and wellbeing. You can explore future events on their website or through the #MAGwellbeing hashtag. The next art of wellbeing tour takes place on Saturday 31st March. *Full disclosure: the shrieks were actually incredibly annoying and mainly emitting from two particularly lively children being entirely ignored by their parka'd dad who was too busy looking through his fringe at his phone to pay them any mind at all - but that didn't paint the serene picture I was going for at that part of the post.